Do you want to capture someone’s interest? Your boss, a potential employer, or a room of 500 people? Tell them a story. Well-delivered personal brand messages create stories worth remembering. Ask yourself, what is it about your story or presentation that will capture attention? I was chatting with my friend William Vablais when he shared a story about a neighbor from Palm Springs, California. He had my attention as I wondered about the age, manners and walking rhythm of the single eccentric woman. Notice how I started filling in the gap of her story? Now she’s eccentric and lives alone! While William’s vignette is an effective example of visual imagery that paints a story, it also illustrates how to create and enhance your personal brand. 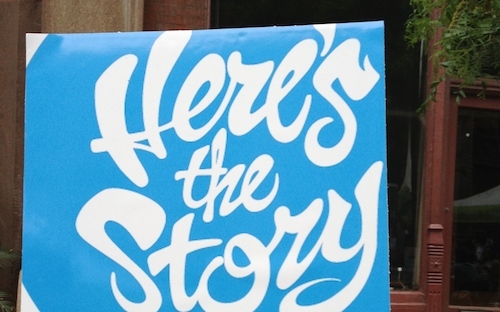 Use storytelling to craft your personal brand messages; create a memorable impression. It might not have anything to do with orange lipstick or a fur coat, but it will benefit from being just as memorable. Create a list of unique personal details. Did you grow up in small town Iowa? Did you experience hardship as a child and then overcome it? Or did you develop a talent because of a persistent vision or innate skill? Envision vignettes of the past, paying attention to the sights, sounds, and smells of those experiences. For example, here is a potential opening line for a story: My immigrant family ran a dry cleaning business on the edge of Chicago’s Logan Square neighborhood… Develop a list of words and phrases that bring these scenarios to life. Keep track of professional accomplishments that shaped you. Are you an author of a business book or novel? Did you launch a new product in a foreign country? Do you have a military background that influenced your life lessons? According to Rory Vaden, find the one problem you solve better than anyone. Become known for one thing, rather than many skills until you breakthrough the clutter. Rory suggests you break through Sheahan’s wall described in this article Why Your Broad Interests are Holding You Back. A singular focus is better than an army of good ideas when first establishing a reputation for yourself. For example, consider the following: Do you consistently create order out of chaotic situations? – give specific examples. Do you tame the demons of distraction for better productivity? Are you the innovation whisperer capable of turning brainstorming sessions into plans for actionable activities? Develop a list of five stories that can be adapted to respond to challenging job interview questions. Use these stories as examples of what makes your background compelling during an important presentation or speech. Be like Mark Schaefer, keynote speaker, best-selling author of Known and executive branding coach. In Mark’s article, How to Give Your First Speech and Knock it Out of the Park, he advises new speakers to avoid the data dump in their speeches. The business-case content overload results in audience boredom and frustration with slide data. Instead or dense boring copy, create 3-5 stories (often personal) with accompanying points. This will results in a higher chance of recall. Create acronyms or a series of stories beginning with the same letter (easy to remember!). Since I focus on the problem of stagnation with the solution of agility, I can start each section with one of the letters of the word A G I L E. For example, A is for Adapt, an important antidote to getting left behind in the workplace. G is for Give…(you get the picture). As championship speaker Craig Valentine says, “what’s loose is lost.” One story and one point only, You may be tempted to add many lessons for each story. Resist this creative temptation. You will lose your audience and your lessons will sound like a boring run-on sentence. And finally, you and your audience will find it way easier to remember one concept per story. With your personal brand messages in tow, you are ready to deliver your presentation. Yet be in the moment for unexpected questions and challenging points of view.